The Range Rover Evoque is getting a major revamp for 2019, with new tech, more cabin space and a range of mild-hybrid engines. The all-new Land Rover crossover will go on sale in the spring, with prices starting at £31,600. The most significant change is the introduction of a 48-volt mild-hybrid for the majority of the Evoque’s petrol and diesel engines. According to Land Rover, the system cuts tailpipe emissions by harvesting energy lost during deceleration and storing it in the under-floor battery. The hybrid system uses the energy in the battery to assist the engine at low-speeds and reduce urban emissions. It isn’t clear how much weight the hybrid system will add to the kerb weight, but Land Rover is quoting 35-52mpg, while CO2 emissions will span from 143-186g/km. A three-cylinder petrol plug-in hybrid will be added to the range in late-2019, but Land Rover has not released any other information on this powertrain. The Evoque's diesel line-up comprises of the familiar 2.0-litre Ingenium with 150PS, 180PS or 240PS. The 2.0 petrol can be specified with 200PS, 249PS or 300PS. Almost all engines get four-wheel drive and a nine-speed ZF nine-speed automatic gearbox as standard, with the only exception being the entry-level 150PS diesel that uses front-wheel drive a six-speed manual. The Evoque gets Land Rover’s latest Terrain Response 2 all-road system – carried over from the Range Rover Velar – to automatically adjust torque delivery to cope with wintery roads and off-road conditions. The driver can also choose a number of preselect driving modes, to cope with wet grass, loose gravel and muddy ruts. The Evoque is also capable of wading through 600mm of water, which is 100mm more than the outgoing model. Land Rover is promising a more refined driving experience on the road, with the hybrid system cutting noise when the car pulls away. The nine-speed transmission has been recalibrated to provide smoother gear changes, while the new stiffer body and rigidly-mounted subframes should cut noise and vibration levels in the cabin. 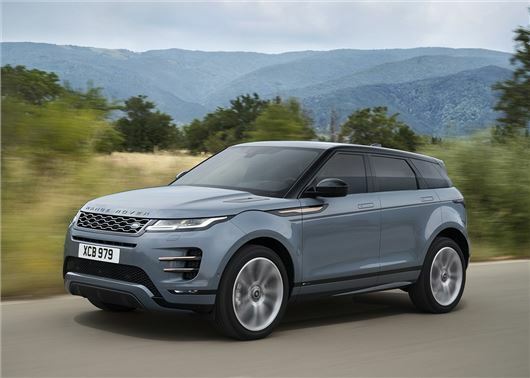 The new Evoque uses a heavily modified version of the existing car's platform, but features a compact new suspension design to provide more interior space. Land Rover says rear passengers get 20mm extra knee room, while bootspace has been increased by 10 per cent to 591 litres when the rear seats are in place. The dashboard mirrors the Velar, with a twin-screen system providing access to audio, navigation and heating controls. The Evoque is the first Land Rover to get Ground View tech, which effectively makes the bonnet invisible by projecting camera imagery onto the upper touchscreen to show a 180-degree view under the front of the vehicle – handy when negotiating difficult parking spaces or high kerbs. Prices start £31,600 for the entry-level front-wheel drive D150 and rise sharply to £35,100 for the all-wheel drive D150 with the automatic gearbox. The petrol P200 will start from £35,950.